What's new in GSI RBCA Tool Kit for Chemical Releases v2.6? Environmental site managers, regulatory authorities, and consultants around the world have increasingly turned to Risk-Based Corrective Action (RBCA) for the management of contaminated soil and groundwater. RBCA is a practical management approach that focuses explicitly on the protection of human health and the environment while promoting energy and cost-efficient remedies to allow limited resources to be targeted to the most hazardous sites. A keystone of the RBCA framework is the development of site-specific environmental cleanup criteria following a tiered risk evaluation approach. This approach is broadly applicable to chemical release sites located in different geographical settings and managed under various regulatory authorities. 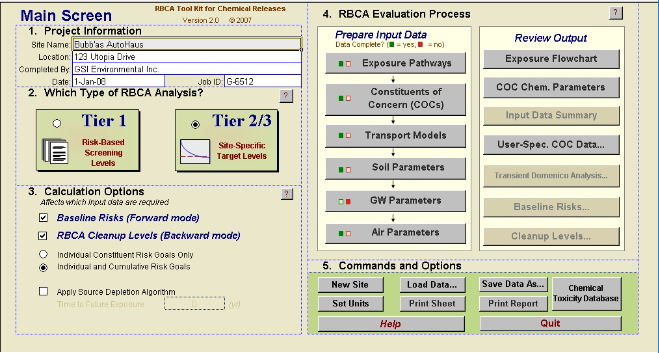 The RBCA Tool Kit for Chemical Releases is a comprehensive modeling and risk characterization software package designed to meet the requirements of the ASTM Standard Guide for Risk-Based Corrective Action (E-2081) for Tier 1 and Tier 2 RBCA evaluations for chemical release sites in addition to traditional risk assessment calculations. The software combines contaminant transport models and risk assessment tools to calculate baseline risk levels and derive risk-based cleanup standards for a full array of soil, groundwater, surface water, and air exposure pathways. The ease-of-use features and streamlined graphical interface features of this software make it an essential tool for handling RBCA and generic risk assessment calculations for both simple and sophisticated problems. Outdoor and indoor inhalation of vapors emanating from soil or groundwater sources. In addition to steady-state air, soil, and groundwater exposure models, the RBCA Tool Kit allows transient groundwater modeling analysis to help estimate not only how high but how soon exposure could occur. Contains default physical, chemical, toxicological and regulatory parameters for over 600 of chemicals, including organic solvents, petroleum hydrocarbons (including TPH fractions), pesticides, metals, and more. The user selects the chemical of concern and the key data loads automatically. Preferences can be specified for using default toxicological parameters from published sources in the USA, Netherlands, and UK. Multiple database files can be customized and easily managed within the RBCA Tool Kit interface for project or location-specific applications. Streamlined graphical interface guides the user through the RBCA evaluation process. Features include convenient unit selection and conversions, importing and exporting, and report printing options. The complete user’s manual, including risk and fate and transport model equations, is available on-line via context sensitive help buttons located throughout the software screens. Produces report-quality output tables of baseline risk and cleanup standards and report-ready summary for each chemical. Includes the 2011 update of the chemical/physical properties and toxicology factors database, published by the Texas Commission on Environmental Quality and containing values for over 650 potential chemicals of concern. Remember, default applicable toxicology parameters and regulatory criteria are provided solely for the convenience of the user and subject to periodic updates. As with all model input parameters, the user should ensure that chemical-specific values are applicable for any particular analysis performed with the RBCA Tool Kit. PC with Minimum 512MB RAM, 500Mhz Processor, Microsoft Windows 2000 or greater. Microsoft Excel 2003, 2007, 2010 or 2013. The software is not compatible with the 64-bit version of Microsoft Excel. This product is only guaranteed to work with English language versions of Microsoft Excel. For more information, please contact GSI. For product technical support, including installation support please click here. Cause: The RBCA Tool Kits prior to version 2.5 are not compatible with Microsoft Office Excel 2007. These versions are only compatible with Microsoft Excel versions 2000, 2002 (XP), and 2003. It is important to note that all of the versions listed above require the latest service packs for Microsoft Excel. Resolution: Use a version of Excel that is compatible with your version of the software. If you require the use of the RBCA Tool Kit for Chemical Releases, version 2.5 is compatible with Microsoft Office Excel 2007. ALTERNATIVELY Every time that the software is run, it requires registration before it is functional. 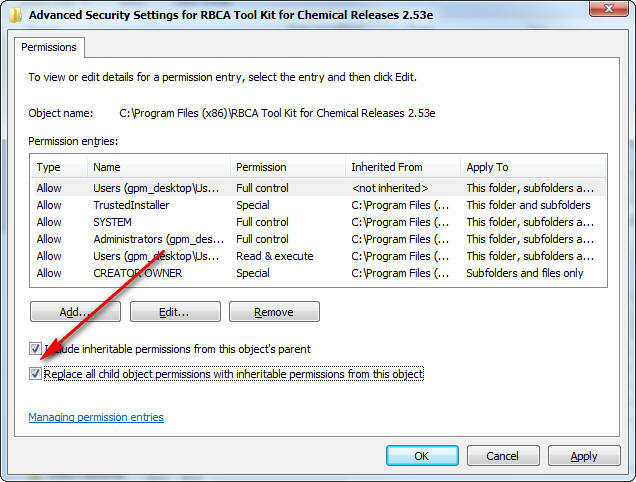 Cause: RBCA Tool Kit for Chemical Releases requires that the user have at least “change” permission to the folder from which the tool kit is running. The various Microsoft Excel files that contain the word “start” in the name (e.g., rbcastart.xls, ACRBCAstart.xla,etc), store user registration data and will not function properly without this level of access. More Information: The above behavior has also been reported in the following situations: * RBCA files reside on a network share instead of the local machine (required). * RBCA files are being run from within an archive (e.g., ZIP, RAR, etc). How to register RBCA Tool Kit software: 1. Launch the tool kit. 2. Put in the appropriate name, company name (if applicable) and registration number. 3. The software will generate an access code. (Make note of this code.) 4. LEAVE EXCEL AND THE TOOL KIT OPEN. 5. Open an internet browser and go to the following address: http://www.gsi-net.com/auth.asp 6. Enter in the required information, including the registration number and access code from #3 above. (Be sure and select the appropriate version of the software.) 7. The website will generate a security code. (Make note of this code.) 8. Switch back to Excel and enter the security code generated in #7 above. 9. Select OK. 10. The RBCA Tool Kit software is now registered and may be used. Symptoms: After installing the RBCA Tool Kit for the first time, you encounter Error 1004 when trying to register the product. Cause: By default when an application is installed on Windows Vista / Windows 7 operating systems the folder is given Read Only permissions. 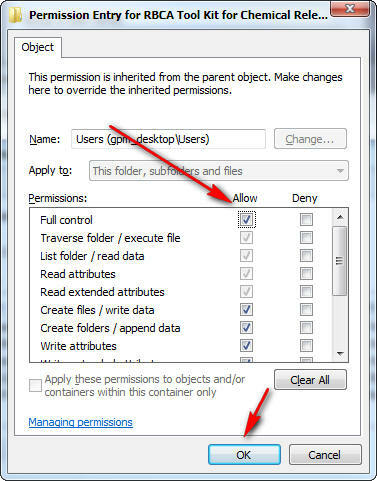 Read and Write permissions are required for the proper operation of the software. This problem has also been known to occur on occasion when the chemical database has been updated. Resolution: Note: The following instructions should be preformed before installing the software. If you have already installed the software and attempted to register it please remove and then re-install the software before attempting the solutions below. For End Users: If you are not an administrator on the computer that the software was installed on you can copy and paste the program folder to a directory under your profile directory (such as your My Documents or Desktop Folders). 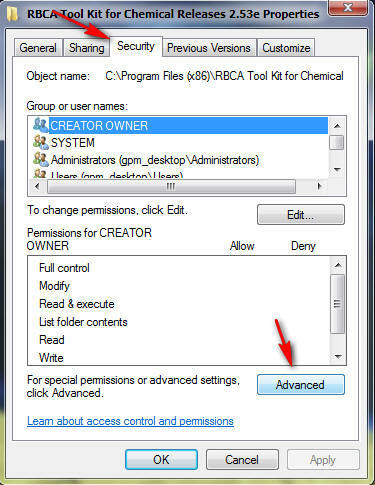 The program shortcuts will not point to the correct location so be sure to launch RBCA by double clicking on the RBCAStart.xls file For Computer Administrators: If you have administrator permissions on the computer the software was installed on your can follow the directions below to enable Read & Write permissions on the folder and its contents. 1. The default install location for the RBCA Tool Kit is in one of the the following folders: 64 Bit Operating Systems: C:\Program Files (x86)\ 32 Bit Operating Systems: C:\Program Files\ 2. Right click on the RBCA program folder. A context menu will appear, left click on the "Properties" Option. 3. Left click on the "Security Tab", then left click on the "Advanced" button located at the bottom right of the dialog window. 4. Click the "Change Permissions" button. 5. Highlight the "Users" entry in the Permissions Entries list and click the "Edit" button. 6. Click the check box next to the "Full Control" permission, then Click "Ok". 7. Left click the "Replace all child objects permissions with inheritable permissions from this object" check box and then left click the "Ok" button. 8. If you receive a Windows Security warning message, left click "Yes". 9. Click "Ok", then "Ok" again to close the dialog boxes that were opened. Once you have completed these steps you can now run the RBCA Tool Kit and register the software. Note: If you had previously tried to register the product, received the 1004 run-time error and saved the file, you will need to remove and re-install the software. Once the software is installed follow the instructions above before registering the product. 1. 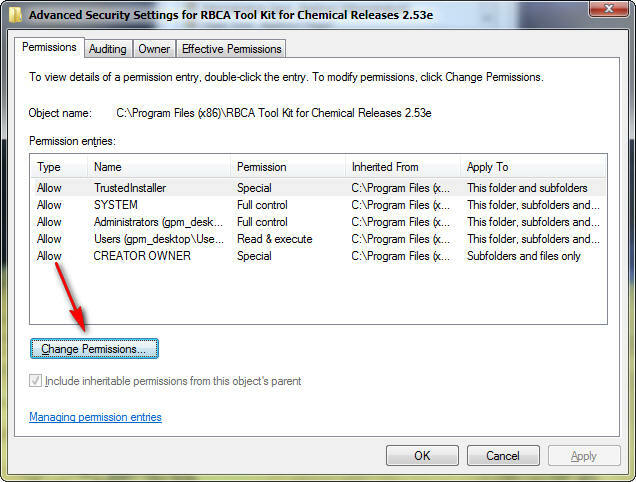 Both the RBCA Tool Kit for Chemical Releases and the RBCA Tool Kit for TRRP come delivered as an executable ZIP file. Run the setup file and allow the files to unzip by clicking "Unzip". 2. You may then start the RBCA Tool Kit by running the start file (C:\rbca\RBCAstart.xla for Chemical Releases, C:\GSI_TRRP\TRRPstart.xla for TRRP). Note: You must enable macros in Excel in order to use the RBCA Tool Kit. 3. You will then be prompted to enter in your registration number and user information. Enter in the information and review your End User License Agreement. After reviewing, you can click "I Agree" to continue. 4. You will then be given an access code which is used to register your software. You can either click "Get Security Code On-line" to get the code directly from GSI's server, or you can get your security code by: Telephone: 713-522-6300 Web: Online Registration 5. Once you have the security code, you can click "OK" to begin using the RBCA Tool Kit. Reinstalling may sometimes be necessary. To reinstall: 1. You may wish first wish to copy your toxicity database (UserChemTox.xls) to another folder, in order to preserve your user-defined settings. 2. You can then delete all of the RBCA Tool Kit program files (there are seven). 3. Reinstall from the original media (CD, or zip file), if it was electronically delivered. You can then register the software as normal. 4. Make sure to replace the UserChemTox.xls file after you have completed reinstalling. This occurs when the user's computer is either not connected to the Internet, or is otherwise blocked by a firewall or proxy server from connecting to the security code server. You may get a security code online by clicking here. This occurs when the RBCA Tool Kit files are corrupted, most often the result of improperly closing the RBCA Tool Kit. The user must reinstall the RBCA Tool Kit from original media, and should take care to always close the RBCA Tool Kit from the "quit" button located in the lower right hand corner of the main menu, and not by simply closing excel. This is a problem with users who have upgraded to Office 2000 or Office XP. Upon installation of the new Office, the security for the Office applications is set to "High", disabling all unsigned macros without prompting the user. While this protects the user against malicious macros, it also prevents the use of the RBCA Tool Kit. To change the security setting in Excel, go to Tools > Macro > Security and select the security level to "Medium". Then restart the RBCA Tool Kit using RBCAstart.xla. It should prompt you for permission to run the macros in the RBCA Tool Kit. It should be noted that, by changing the security setting, it is possible for a user to run harmful macros, although they will be prompted before doing so. Also, some companies have intentionally disabled macros for security reasons. Users in this situation will need to consult with their I.T. administrator, as the RBCA Tool Kit will not work with the macros disabled. It was also noted that there are some problems running the RBCA Tool Kit for TRRP under Office XP. This problem may be resolved by applying Office Service Pack 2. This is freely downloadable from the Microsoft websit at http://www.microsoft.com/downloads/details.aspx?FamilyID=1a8ce553-ab76-4a63-99da-b4ed914c1514&DisplayLang=en. 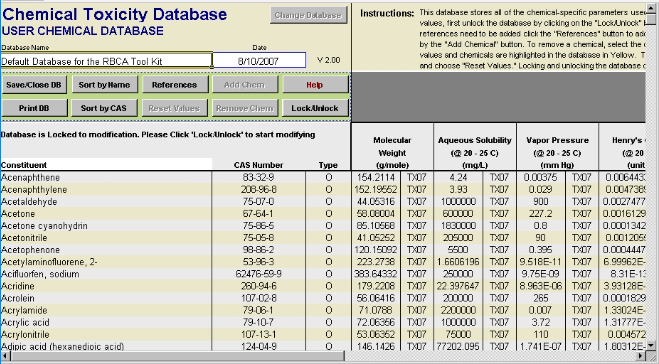 The RBCA Tool Kit for Chemical Releases, version 1.2 and earlier may fail to start properly (Excel reports a "Type Mismatch" macro error) after customizing certain chemicals in the chemical data base. The problem stems from a few of the CAS numbers in the built-in database containing dashes ("-") whereas they should be stored as numbers alone. (for example, "7440-36-0" verses "7440360" for Antimony.) When the software loads the custom database upon startup, dashes included in a CAS number will cause a "Type Mismatch" error in Excel. We cannot correct the built-in database until a future software update is released; however, in the meantime faulty CAS numbers in the custom chemical database can be fixed with the "patch" program. To do this: 1. Download the file User ChemTox patch.xls below and open it in Excel. 2. The patch program will prompt you to select your custom database file ("UserChemTox.xls"). 3. Check and convert any faulty CAS numbers, then save and close the file. Please be sure to select "No" when prompts whether to update links. (Selecting "Yes" will not hurt anything, but could tie up your computer for awhile.) 4. After running the patch program, you should be able to successfully restart the RBCA Tool Kit with your customized chemical data. To circumvent this problem while customizing your chemical database again in the future, you can simply reenter the CAS number without any dashes along with your customized values. If the "type mismatch" error occurs again when reinstalling the RBCA Tool Kit, you can run the patch program again to clean up the custom database file. Since there have been reports of problems running the RBCA Tool Kit under non-English language versions of Excel and Windows with success, GSI recommends using the English language versions of both Excel and Windows, and will not support users running in any other versions. This is a problem with users who have upgraded to Office 2000 or, more recently, Office XP. Upon installation of the new Office, the security for the Office applications is set to "High", disabling all unsigned macros without prompting the user. While this protects the user against malicious macros, it also prevents the use of the RBCA Tool Kit. To change the security setting in Excel, go to Tools > Macro > Security and select the security level to "Medium". Then restart the RBCA Tool Kit using RBCAstart.xla. It should prompt you for permission to run the macros in the RBCA Tool Kit. It should be noted that, by changing the security setting, it is possible for a user to run harmful macros, although they will be prompted before doing so. Also, some companies have intentionally disabled macros for security reasons. Users in this situation will need to consult with their I.T. administrator, as the RBCA Tool Kit will not work with the macros disabled. It was also noted that there are some problems running the RBCA Tool Kit for TRRP under Office XP. This problem may be resolved by applying Office Service Pack 2. This is freely downloadable from the Microsoft websit at http://www.microsoft.com/downloads/details.aspx?FamilyID=1a8ce553-ab76-4a63-99da-b4ed914c1514&DisplayLang=en. GSI occasionally releases updates to our software products. Sometimes our updates are free, sometimes we charge, depending on the nature of the update. Download and order updates here. Lead is a non-cancer toxicant which is known to cause central nervous system (CNS) effects in children. The U.S. Environmental Protection Agency (USEPA) has established reference dose (RfD) values for a large number of non-cancer toxicants. Exposure to a compound at a level below the RfD is assumed to be safe. However, studies of lead toxicity have not established a "safe" exposure limit for lead. Therefore, the USEPA has not established an RfD for lead. RfD values for lead are not provided in the USEPA IRIS database or in any other toxicity database widely used to select toxicity values for the RBCA process. In the RBCA process, the RfD value is required to calculate the risk-based cleanup standard (RBSL or SSTL) for a non-cancer toxicant. Because no widely accepted RfD value has been established for lead, it is not possible to include lead in the RBCA Tool Kit database. Lead can be added to the software using the "Add New Chemical" tool. However, the user will be required to provide an RfD value and other relevant chemical parameters. The U.S. EPA has established an action level for drinking water limit of 0.015 mg/L. In addition, the state of Texas has established a limit of 500 mg/kg for direct exposure to residential soils, and Louisiana has established a limit of 400 mg/kg for direct exposure to residential soils. However, none of these limits are risk-based limits. When performing a RBCA assessment, comparing the results for the backward calculation (risk-based cleanup levels) to the results for the forward calculation (risk levels) does not always yield the same result for a site. In other words, comparing calculated risk levels to user-specified target risks may indicate that risk levels are acceptable at a site; however, concentrations detected at the site may exceed risk-based screening levels (e.g., RBSLs) generated using the same target risks, or vice versa. When reading the following, please keep in mind that forward-mode calculations include the transient Domenico analysis worksheets, and cumulative risk calculation sheet, and backward-mode calculations include the TPH calculation worksheets. In general, the two modes use the same models and input parameters, but in certain cases, the results will not always be identical because the two modes use different assumptions. The primary reasons the two methods may not always give the same results are listed below: Backward-mode calculations sometimes include non-risk-based criteria, such as MCLs, as alternate criteria to the risk-based values. Backward-mode calculations screen out results that exceed solubility or soil residual concentrations for indirect pathways. Target values calculated above these levels are flagged by the software as ">", and either the aqueous solubility or soil saturation limit, depending on whether a groundwater or soil concentration is being reported. Forward-mode calculations do not screen for these values, which may result in inappropriately large risk values. Backward-mode calculations for the surface soil pathway will combine intakes due to ingestion, dermal contact, and inhalation of volatiles and particulates. Forward mode calculations do not combine these intakes. These inconsistencies result from standard practices within the technical community that differ between the two methods. As with any model, the user is advised to review the underlying assumptions and determine whether they are appropriate for conditions at the site being modeled. To develop performance standards for a groundwater barrier wall, the RBCA Tool Kit can be run in "backward mode" to determine the applicable groundwater SSTLs based on the site-specific source location, groundwater parameters, and applicable point of exposure. These calculated SSTL values for each COC can then be entered into the software as the Representative Source Concentrations and the software rerun in "forward mode" using the Transient Domenico Worksheet to determine the predicted steady-state plume concentrations at each point downstream of the source location. As long as an engineered barrier serves to prevent the downstream concentrations from exceeding these allowable levels, the risk limits at the point of exposure will not be exceeded. In other words, the steady-state Domenico plot shows how much the groundwater barrier can leak before it becomes a problem. If a barrier wall is installed, the concentration limits determined in this manner can be used to monitor the performance of the wall. 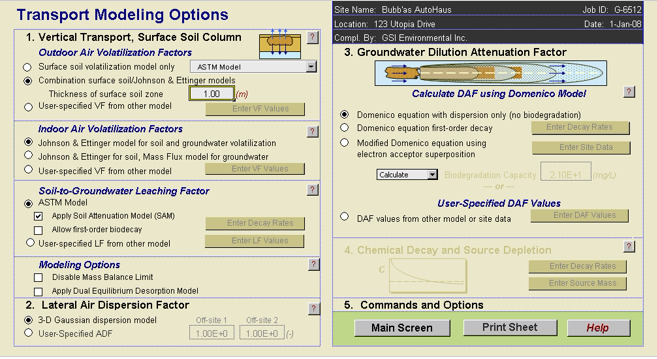 A similar analysis can be run for the soil leaching pathway by i) entering the actual measured soil COC concentrations and other site-specific soil and groundwater data and ii) running the software in the forward mode, and iii) adjusting the net rainfall infiltration level until you find the maximum level allowable such that none of the COCs cause a risk limit exceedance at the point of exposure. This final rainfall infiltration rate is the maximum seepage that can be allowed by a site cover. This level represents the rate up to which the site cover can leak before it poses a problem. A common misunderstanding we have encountered is in the soil source zone characteristics with regards to the affected soil zone. 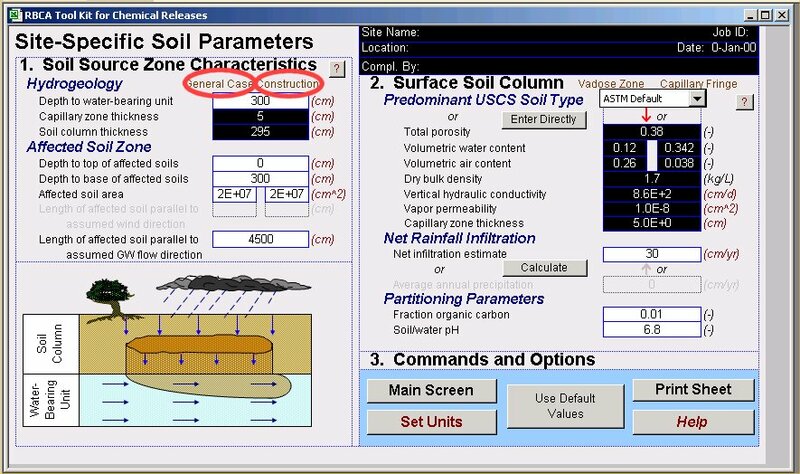 Some users have inserted values for the affected soil zone and depth to water indicating that the affected soil is below the water level. This can lead to miscalculations in the soil leaching to groundwater pathway. The base of the affected soil should be above the top of the water bearing unit. We suggest that you change your input to correct this error. The confusion lies in the left-hand column of entries where there are two input values for the affected soil area and the length of soil parallel to the assumed wind direction. The reason for the two different inputs is because those values may differ for those calculating risk under the construction worker scenario. The right side values are for the construction worker, while the left side values are for the general case. These numbers may be different for a construction worker, who could be in closer contact with the soil than a normal commercial or residential receptor. The construction worker scenario appeared in the draft of the ASTM RBCA standard, but not in the finalized version. It is included in the RBCA Tool Kit as an additional receptor type available to the user. This two value types are indicated at the top of the number columns (circled in the screen shot above in red). However, the column headers are grayed out on the screen, and the purpose of the two different values was not clearly explained in the manual. Similarly, the purpose for the two values in the volumetric water/air content in part 2: Surface Soil Column, is to differentiate between the vadose zone and the capillary fringe. Several discrepancies have been noted in comparing the RBCA Tool Kit against values published in the ASTM Tier 1 RBSL Tables. The known discrepancies that we are aware of are generally related to errors or omissions in the ASTM calculations or Standard (PS-104-98) and have, for the most part, been attributed to one of the following issues: 1) While the equations in the ASTM standard correctly impose a mass balance constraint on the surface soil volatilization factor (VFss), the ASTM standard incorrectly fails to account for mass balance constraints for volatilization from subsurface soils (VFsamb and VFsesp). These mass balance constraints are incorporated into the RBCA Tool Kit to prevent the gross overprediction of sustained volatilization rates. Please see equations CM-3b and CM-4b on page B-3, and the associated text on pages B-5 and B-6 of the RBCA Tool Kit manual. 2) The ASTM calculations for the air pathways use Inhalation Reference Doses and Slope Factors which were derived, assuming a 20 m3/day air inhalation rate, from Inhalation Reference Concentrations and Unit Risk Factors published in IRIS, HEAST, etc. However, the ASTM default indoor air inhalation rate is 15 m3/day. Therefore, the correct Inhalation Reference Doses and Slope Factors would be different for indoor vs. outdoor inhalation. The RBCA Tool Kit (correctly) uses the actual Inhalation Reference Concentrations and Unit Risk Factors, as recommended by the US EPA, and as presented in the equations for Air Exposure on Table A.2 (page A-12/13) of the RBCA Tool Kit Manual. Some users outside of the United States have reported problems loading and saving RBCA Tool Kit data files. Specifically, when Windows is configured to use the "," (comma) for the decimal and the "." (period) for the digit grouping symbol, then values for some input parameters may be corrupted when data is saved or loaded into the RBCA Tool Kit, depending on the particular language/version combination of Windows and Excel (e.g. English Windows NT 4.0 with Portuguese Excel 97, etc.) It was determined that this problem does not occur when the "Regional Settings" feature in Windows is set to "English (United States)". To access this feature, choose Settings, then Control Panel, from the Windows "Start" button. In the Control Panel window, open Regional Settings and choose "English (United States)". Alternatively, the Regional Settings language/country setting may be left as is, and under the "Number" tab choose "." (period) for the decimal symbol and "," (comma) for the digit grouping symbol. 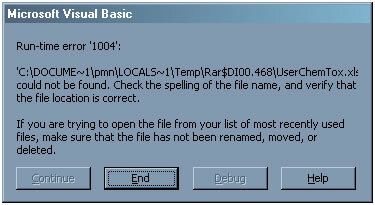 On some computers, clicking "Air Parameters" on the Main Screen may consistently result in an Excel application crash following a message that the application (Excel) has performed an illegal operation. If this occurs, unsaved data in any Excel workbooks will be lost. This problem does not occur while Excel's Visual Basic Editor application is running. If the problem occurs, restart Excel and the RBCA Tool Kit. 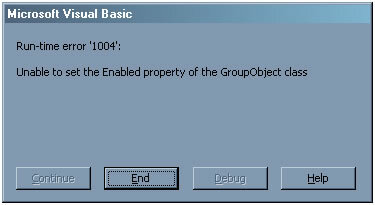 Before beginning to work with the RBCA Tool Kit, select "Visual Basic Editor" from the Macros selection in the Tools menu or, alternatively, press Alt+F11 on the keyboard to invoke the Visual Basic Editor application. Then return to Excel (via the Task Bar, Alt+F11, Alt+Tab, or clicking the appropriate window) and proceed to work as usual with the RBCA Tool Kit. The input cells for air inhalation rates have been removed from versions 1.1 and greater because those parameters are not used in any calculations. Users of version 1.0a may observe that air pathway risks or cleanup standards did not change when varying the inhalation rates. 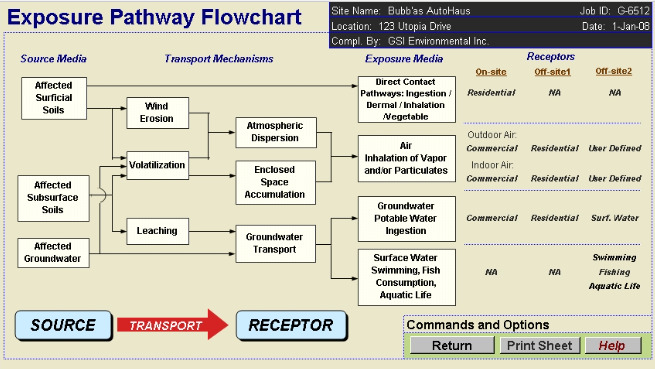 In the RBCA Tool Kit for Chemical Releases, the air inhalation pathway calculations are based on reference concentrations, as opposed to reference doses for non-carcinogens, and unit risk factors, as opposed to slope factors for carcinogens (please see the air pathway equations on page A-12 of the software manual). These are the inhalation toxicity parameters actually measured for each COC in toxicological studies and reported by EPA in IRIS, HEAST, etc. These values are independent of inhalation rates and body weight. Converting reference concentrations to reference doses or unit risk factors to slope factors requires assumptions regarding inhalation rates and body weight (typically the RME values). Thus, whenever you see an inhalation reference dose or slope factor, implicit assumptions regarding inhalation rates and body weight have already been make in order to calculate that value. Although the calculations in the RBCA Tool Kit make no assumption with regard to inhalation rates, in essence you can account for varying assumed rates by scaling the exposure duration or exposure frequency parameters by the corresponding factors. For example, if you wanted to assume an inhalation rate of 15 m3/day, as opposed to a 20 m3day RME value, you could scale the default exposure frequency of 350 days/yr to (350*15/20)=262.5 days/yr to account for an equivalent reduction in inhalation exposure, based on the measured reference concentration or unit risk factor. Users of the RBCA Tool Kit may wish to note that it is possible to keep multiple customized chemical databases, which is useful for those who perform risk assessments in locations with different regulatory standards. The customized chemical database is stored in a file called "UserChemTox.xls". Users who wish to keep multiple databases can rename this file with a meaningful name after use. The RBCA Tool Kit only accesses the file UserChemTox.xls for all of its custom information, so the storage files must be renamed whenever you switch custom databases. There are no plans to implement the direct support of multiple custom databases in the RBCA Tool Kit at this time. For users who have to reinstall the RBCA Tool Kit, it is also worth noting that you can move the UserChemTox.xls file to another location in order to preserve the data when reinstalling. 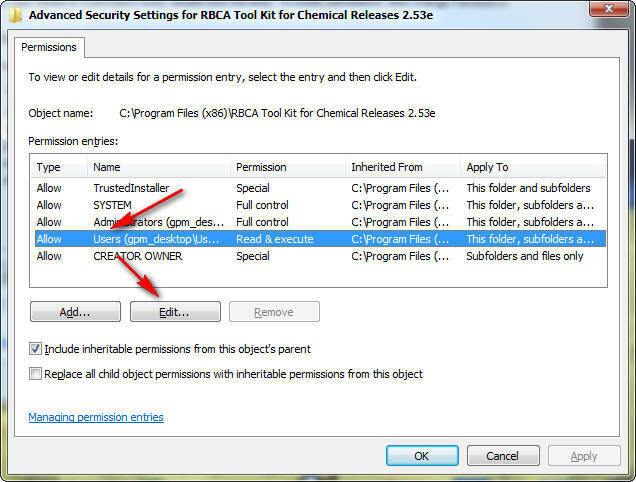 After installation is complete, the user must move the UserChemTox.xls file back into the RBCA Tool Kit folder. There are additional problems that occur when you attempt to use multiple chemical databases. This issue is being addressed by the developers for the next edition of the RBCA Tool Kit. The chemical database included with the RBCA Tool Kit was as complete as we could make it while maintaining proper citations. Any chemicals not listed in the RBCA Tool Kit database must be added by the user. For various reasons, we do not typically grant user requests for chemical information. However, the following link to the US EPA IRIS database may help you out: http://www.epa.gov/iriswebp/iris/index.aspl The instructions for customizing the chemical database are on pages 16-17 of the RBCA Tool Kit manual, or on pages 19-20 of the RBCA Tool Kit for TRRP manual. Sometimes, you just need a person to answer your question. Technical support for GSI software products is available on a pay-per-incident basis. "Pay-per-incident" means that the user will be charged a one-time flat-rate fee of $50.00 for resolution of a single technical support issue. For more information, please read our technical support policy statement.